The NH-NL ratio finished at 97-182 on Thursday, staying on the negative side, reminding us that a rally is not taking place. Sellers continue to have their way with a 3-to-1 advantage during Thursday’s session as the NASDAQ gave back 2% (all of Wednesday’s gain) but volume was lighter. Staying on the topic of “large caps”, I noticed that Apple gained 12% after reporting bullish sales, Google fared better than Yahoo but is only up 0.49% heading into the final hour of trading on Friday (under both the 50-d m.a. and 200-d m.a.). The S&P 100 Index/S&P 600 Small Cap Index that I track is up over 6% this week for its largest gain in years, confirming that large caps are moving to the head of the class. Investor’s Business Daily pointed out how CBOT (a stock I have highlighted on this blog in the past) blew past expectations but couldn’t gain much ground throughout the day after reaching a high of $126. The stock is actually down 3% today, telling us that buyers don’t have a chance, at least not now. The stock has formed a V-shaped cup with handle with a pivot point of $124.58 (breakout volume should reach 600k shares). If the NASDAQ closes where it is right now, it will have its lowest close of the year (the lowest since May 2005). The S&P 500 index challenged its former support (now resistance) of 1,245 earlier in the week but looks set to close below this level within the next hour. Crude has dropped the past four days and attempted to climb back above $75 earlier in the day but looks like it too will close below former support (now acting as resistance). So, are there any stocks out there to consider for a watch list? ADS – the stock has been falling for three straight weeks but I told MS members that this could be the case since it had to fill the gap from April, something it may be doing (down to $47.50). 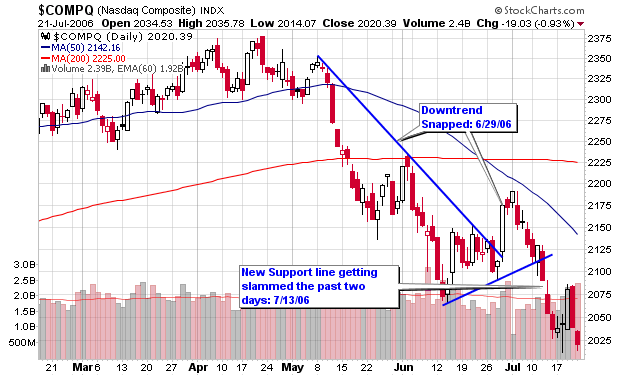 If it bases here (or gets support), I am buying several calls to speculate on my idea of a bounce. GRMN – down over 2% for the week but the stock continues to hold the 50-d m.a. as support while maintaining a presence near the psychological triple digit threshold. I still like the stock in a rallying market (could make a nice option play for a solid run). ZUMZ – trading in a range of $30 and $37.50 for the past 12 weeks with some minor intra-week movements above and below the major range. The most recent breakout of $36 was reversed but who can blame the stock in this type of market. 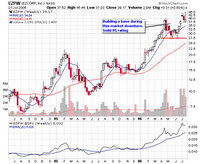 EZPW – filled the gap back down to $38 and is now trading between this level and the high above $45. I would consider this a handle to a longer pattern that could give us a nice run if the market were to breakout. ARP – trading in a range between $32 and $39 for the past 18 weeks, all above the 200-d m.a. 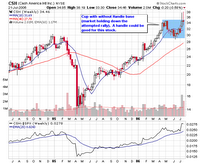 The stock has a supporting relative strength rating that suggests it can move higher in the next rally. MAA – an 18 week base that has held up for the most part during the past two months as its relative strength rating continue to soar. 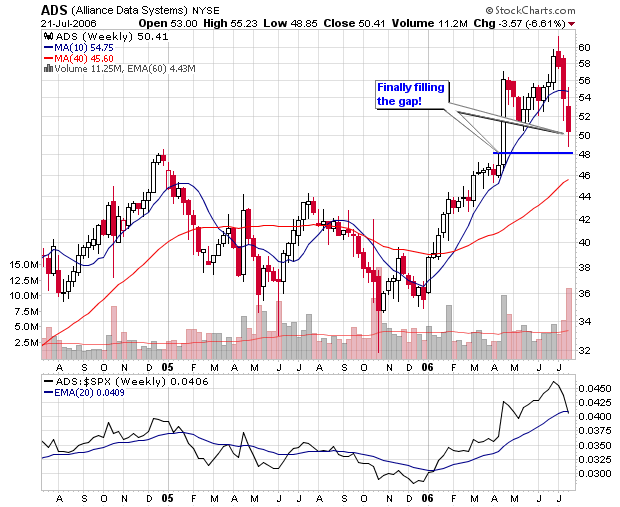 A breakout to new highs is a buy point on the point and figure chart ($58). ORB – the stock has been acting very well this week amid the negative tone among the other leaders and the major indexes. It managed to gain more than 5% during a weak of turmoil and it did so on heavier volume (above average). 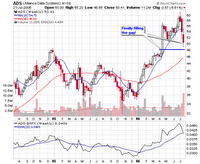 With the strong moves above $16, the stock is now slightly extended but one to continue to watch. MED – the speculative stock that made us money earlier in the year is now forming a sideways consolidation base, one that has lasted for seven weeks. The support seems to step in near $16 with the weekly breakout above $20. Of all the stocks listed, this may become the best play for pure traders. 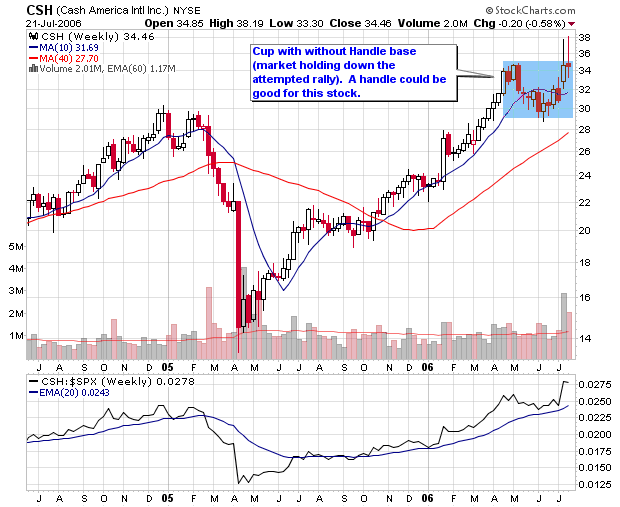 CSH – the stock has formed an 11-week cup shaped base without a handle. It attempted to breakout over the past two weeks but has not succeeded due to the weak market but this could be beneficial as it might form a proper handle. With today’s intraday low, the stock has basically filled the two gaps from earlier in the month.